Below is the summary of Orams Case prepared by the Naomi Mehmet & Partners law firm. The case of Linda and David Orams involves a piece of land in Lapta, T.R.N.C. which Mr. and Mrs. Orams purchased and had registered in their names in accordance with the laws of the T.R.N.C. and subsequently built on. In 2004, Meletios Apostolides, the Greek Cypriot who owned the land prior to the Turkish military intervention in 1974, obtained an order from the Nicosia District Court in South Cyprus, which is an EU member, ordering Mr. and Mrs. Orams to demolish and vacate the house and pay compensation for the use of the land. The order was obtained against Mr. and Mrs. Orams in default of appearance, although their subsequent application for the decision to be set-aside was rejected. The lawyer for Mr Meletios Apostolides, then, by relying on EU law, applied to the courts in the UK for the judgment to be enforced against Mr and Mrs Orams and their assets there. In 2005, Meletios Apostolides registered the judgments of the Nicosia court at the High Court in the UK. Mr. and Mrs. Orams subsequently appealed against this and judgment was given in their favour in September 2006. Judge Mr. Justice Jack stated that the judgments could not be enforceable because EU Law is suspended in the North and the administration in the South does not exercise effective control over the North. He also felt that such cases are the result of an ‘international problem ill-suited to be resolved by private litigation’. Mr. Apostolides then appealed to the Court of Appeal. The Court of Appeal referred the matter to the European Court of Justice (ECJ) for a preliminary ruling. On 28th April 2009, the ECJ ruled that the fact that EU law is suspended in the T.R.N.C. and the fact that the Government of the Republic of Cyprus does not exercise effective control do not preclude the enforcement of the judgment in a member state. The ECJ also rejected arguments on public policy and arguments that the judgment was a default judgment on the basis that Mr. and Mrs. Orams had applied for a ‘Set-Aside’ Order which had been rejected. The matter then reverted back to the Court of Appeal. Judgment was given on 19th January 2010 in which the Court of Appeal applied the ruling of the ECJ and rejected Mr. and Mrs. Orams’ claims that the enforcement of the judgment was contrary to public policy and claims that the President of the ECJ at the time when the ruling of the ECJ was given, Judge Skouris, was biased. Unfortunately, any further appeal by Mr. and Mrs. Orams to the House of Lords is prevented under the relevant legislation and leave to appeal on the grounds that the matter represents an important principle of law has been rejected. In order to try to comply with the judgment, Mr. and Mrs. Orams have submitted an application to the District Office (Kaymakamlik) for permission to demolish the property. However, this application has been rejected. The legal team for Mr. and Mrs. Orams in the UK intends, therefore, to submit an application for the enforceability of the ‘demolition’ part of the court order to be declared impossible. It is understood that the TRNC Government has also stated that they will pay all of the mesne profits which Mr. and Mrs. Orams have been ordered to pay to Mr Apostolides together with his legal costs and Mr. and Mrs. Orams’ own legal costs and to refund the money which they paid to purchase the property and build on it. 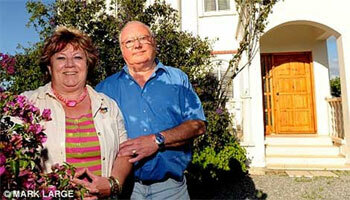 Mr. and Mrs. Orams have filed a case in the European Court of Human Rights (E.C.H.R.) to argue that they did not receive a fair trial in the South and that this constitutes a breach of their right to a fair trial under Article 6 of the European Convention on Human Rights and to argue that the judgment contradicts recent case law of the E.C.H.R. in which the T.R.N.C. Property Compensation Commission, a Commission established by the T.R.N.C. authorities to consider and resolve applications by Greek Cypriots for settlement for their property left behind in 1974, was recognised and endorsed by the E.C.H.R. as a local remedy for such claims. A meeting was held in January 2010 for the members of the T.R.N.C. Bar Association to discuss the ‘Orams’ case. It was decided that meetings would be sought with the Government to try to discuss legislative measures which can be taken to provide protection to purchasers in the T.R.N.C. It has been argued by some political commentators that the result in this case will undermine efforts to re-unite the island through the current negotiation process for a comprehensive settlement. Some commentators on the Greek Cypriot side are also concerned that Turkish Cypriots might launch similar individual legal cases in relation to their properties left behind in the South, leaving the Greek Cypriot administration with a heavy financial burden. having read this summary of the justice system currently in use in the EU I wonder why any existing or potential member state would wish to join such an immature and in-coherent organsiation ! Stop the train I want to get off!!! This web page is served on 19 April 2019 at 23:17:40.